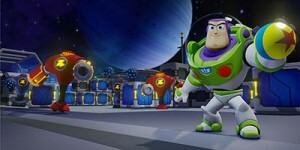 The latest, and I believe final, Disney Infinity playset is Toy Story In Space. It seems they have saved the best for last since this adventure offers some of the more interesting additions to the Toy Box mode and presents itself in a very fun way that captures the spirit of Toy Story rather well. The adventure starts out with your characters landing on an alien world and trying to protect a local colony from volcano bombardment. The exact details of how and why you are here never really seem to be revealed but it seems obvious enough that you must be playing through the imaginary world of whoever is playing with the toys. The pack contains the Buzz Lightyear and Jesse figures. Surprisingly Woody is sold separately, but it makes sense from a marketing standpoint, at least. If the playset had both Woody and Buzz then I imagine there would be tons of Jesse figures on store shelves, and that never looks good. But really, who wants to play as Jesse? Maybe I’m alone in this but I find the character to be obnoxious. I’m not entirely sure if Tom Hanks and Tim Allen reprise their roles or not, but it sure does sound like them. Jesse’s VA is different, however. Other than that it seems like the rest of the NPC toys are played by their original voices. Ham is definitely Ratzenberger and Rex is obviously Wallace Shawn, or The Nagus as we call him. I definitely appreciate it when original VAs reprise their roles because I find the alternative to be rather off-putting. Quite possibly the best part of the adventure would be the LGMs (Little Green Men aliens). The whole adventure is full of them and everything they say is pure gold. The phrasing and inflection used to deliver each line is absolutely hilarious and Keen and I were laughing at almost everything they said. This adventure is not unlike some of the other playsets. You can roam around collecting capsules that contain more toys and completing various quests. During your stay in the Alien Outpost you also contribute to building it up by adding additional facilities. One such building lets you take on various simulation missions and battle against several of Emperor Zurg’s robot minions, which is a fun diversion when you tire of running quests. Blaster – A Star Command blaster pistol that is quite useful for shooting your friends and enemies alike. Pixar Ball – Each Toy Story character throws these by default but you also gain access to a baseball variant, larger version, and even one that can be throw at people to heal them! Jet Pack – Zoom around the world fast, but unfortunately you can’t gain any altitude. Still useful for crossing vast distances and empty voids. Bullseye/Alien Horse – Not really an inventory item but still useful. Ride around on Bullseye speedily or mount the Alien variant and use it to bash through obstacles. Goo Guns – They come in two colors: Green and Purple. The green goo makes things grow to 3x their size and the purple shrinks them. Make your friends giant and your enemies tiny! Or the reverse! The Toy Story playset is by far my favorite of the additional sets and comes in right behind Pirates in terms of all-around greatness. 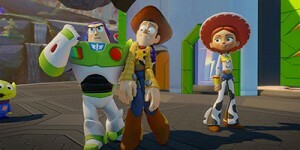 It’s full of fun, familiar characters and awesome additions to the Toy Box. You’ll get at least 7-8 hours out of the adventure alone and it’s totally worth it. It’s funny how my 9 and 11 year olds have ZERO desire to play this game. They are all into the SkyLanders again. They just never really got interested in anything Disney and love the more “macho” characters in SL. Thanks again for all your updates. For a while I was really liking DIsney Infinity more than Skylanders. Then Swap Force came out and suddenly I liked SKylanders more. And now that I’ve played this Toy Story pack, I realize I like both for very different reasons. Skylanders is the action/adventure game for me, and Disney Infinity is more of a sandbox/alternative gameplay.